I really love old literature, especially dismal Victoriana (that should be a genre) but for my reading and writing development, I need to shake myself out of my soot-blackened, clog-wearing, TB-coughing rut and read something completely different. I bought ‘Dune’ when I was a child my mum said she’d take us tot he cinema to see it, but then just before we were due to leave, I got muddy, and the trip was cancelled. This went into my top ten of childhood injustices, but in later years my mother admitted she seized on this opportunity to cancel the Dune trip as she had decided it might be too scary for us. Why she couldn’t just say that rather than have me and my muddy socks carry the blame in my brother’s eyes for decades, I don’t know. I never did get round to seeing the film, and no amount of mud can come between me and book. 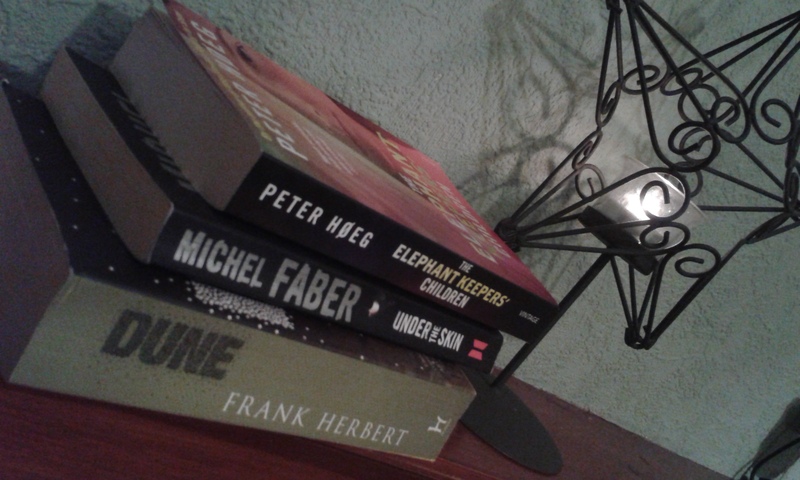 ‘The Elephant Keeper’s Children’ is something I’ve had for a while, and bought it after I read, and really loved, ‘Miss Smilla’s Feeling For Snow’, which contained my other love, chilly Scandinavian noir. Judging by the cover it’s nothing like that, but still should be interesting. I was inspired to watch ‘Under The Skin’ after hearing about the originality of its score, and also for the fun of seeing pieces Glasgow I know. How the utter weirdness of that film could be written as a book fascinates me. The problem is I’m currently reading too many books, and should not start anything new, but desire to get to these is helping power through the remains of ‘Clarissa’, ‘Tristram Shandy’, and Will Self’s ‘Dorian’. Starting new books is like clean duvet cover night, the simple pleasures are the best. ← Infinite Joy – ‘Infinite Jest’ Has Been Lego’ed! Clean duvet cover night – exactly! ‘Under The Skin’ is a magnificent read. I’ve yet to see the film and am equally curious to know how on earth such a weird and unsettling book could be recreated on screen. After you’ve read it and I’ve seen it we should definitely compare notes! It’s quite a fascinating way to do things. Some books do seem as if they would make bizarre films, I wondered how Life Of Pi would be on screen, and it wasn’t as interesting as I’d hoped. But this is so weird, I think you’ll be pleasantly and uncomfortably surprised. I understand exactly what you mean about shaking yourself out of a Victorian reading rut. I have never read Dune, but I am a sucker for Richard Adam’s fantasy novels like “Maia” and any of the Dystopian fabulousness of author Sheri Tepper (I highly recommend “Grass” and “The Gate to Women’s Country”). I actually cannot understand reading one genre to the exclusion of all others, though historicals and mysteries definitely get the largest percentage of my time. Having said that, there is nothing like a good, depressing dystopian fantasy to make you appreciate soot covered, Dickensian London! I’ve also been thinking about Dune, but am reading to many other books. Dilemma! I went through a science fiction phase as a teenager and read all the Dune books then. As I remember it the concept and plot were quite decent but buried in a lot very dense world creation/depiction and a very male of the period take on its women characters. The film was pants – you didn’t miss anything. I did end up trying to watch the film in the end, i found a version on Youtube and so was glad I was able to stop watching after about an hour and it hadn’t cost me anything!